Policymakers continuing to wrestle with issue of how sustaining peace, prevention and the 2030 Agenda for Sustainable Development work together, could look no further than The Gambia as a case study. The country’s fragile transition since national elections in January this year provide considerable room for studying and responding to the root causes of conflict by pursuing both peace and development in a holistic manner. This focus is in keeping with both sustaining peace and the 2030 Agenda, which, while intended to be universal processes, have been criticized in regards to their practical application, both in isolation and in combination. In January 2017, former Gambian President Yahya Jammeh conceded defeat in a national election and handed power to President Adama Barrow. This was not, however, a smooth process and much of the credit for maintaining peace goes to regional institutions, particularly the Economic Community of West African States (ECOWAS). Barrow won the election by promising to free The Gambia from dictatorship. He was then tasked with righting the country’s brutal political past, which included widespread killing of protestors; unlawful arrests and detention; torture of prisoners; and repression of media and gay, lesbian, bisexual, and transgender people. The new government has already taken some notable positive steps, including increasing media freedom by working towards fully liberalizing the broadcasting sector and encouraging the establishment of private television stations. It has also developed a rather comprehensive and well-articulated draft of a national development plan covering the next five years. However, the only concrete priorities so far discussed focus on transitional justice, security sector reform, and constitutional review, leaving Gambians to wonder about those issues that impact their daily lives, namely socio-economic development. The Gambia has had to contend with these issues while suffering a complicated economic crisis from which it has received little international relief. It has a public debt of $1 billion, which amounts to 120% of the Gambia’s gross domestic product during the “last decade of ex-president Yahya Jammeh’s rule, according to the IMF and World Bank”. Preliminary Findings of the 2015/16 Integrated Household Survey revel that the poverty rate of the rural areas registers at 69.5 percent in 2015- a 8.3 percent increase from 2010. Though rural areas have less than 40% of the country’s population, they hold 64% of its poor. Key indicators related to access to health and education and basic services all show an urban-rural divide and a need for the government to act decisively. As is widely known, prevention is the central focus of Guterres’ ambitious reform program. “Sustaining peace”—a holistic approach to peacebuilding adopted across the UN system in April 2016—and 2030 Agenda are seen as means to achieve this. Sustaining peace seeks to implement a coherent and coordinated approach to peacebuilding, through strengthening institutions and promoting economic growth and poverty eradication, social development, good governance, gender equality, and respect for, and protection of, human rights and fundamental freedoms. The 2030 Agenda, meanwhile, argues that social, economic, and environmental progress help create conditions for peace. Within this agenda, Sustainable Development Goal (SDG) 16 is seen as the main measure for “fostering peaceful, just and inclusive societies which are free from fear and violence,” and is a connector with sustaining peace. The Gambia’s ability to avoid the precipice of instability despite its complicated political handover, the challenges facing its incoming government, and ongoing economic crisis, suggests that it retains several important sources of resilience. Using sustaining peace and the 2030 Agenda as guidelines, United Nations Secretary-General Antonio Guterres’, the wider UN, and the international community could work to support these. Just as important, these actors could look to address persistent risks that threaten to derail the country’s progress. One of the most obvious factors counting in The Gambia’s favor is its youth (taken as 24 and under), which make up close to 60% of the population. Members of this group have exhibited a strong drive to make the country stronger. 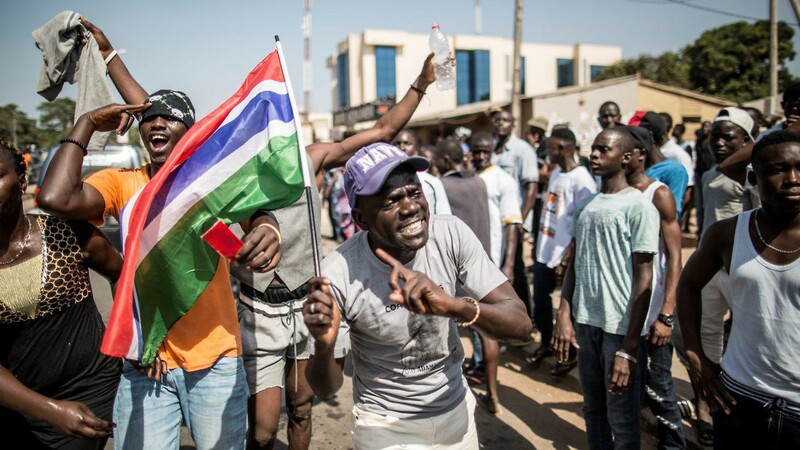 Despite young people being commonly perceived as a risk factor for conflict, young Gambians played an instrumental role in the political transition following the January election, applying pressure on Jammeh to accept the results through protests and media efforts. This includes the #Gambiahasdecided campaign, which is supported by the Gambia National Youth Council. These campaigns are in turn working actively with the government to increase the agency of youth in politics and economic activity. International actors could build on this progress, including through enhancing innovation around job creation and skills-focused education. Young Gambians have particularly high expectations regarding their options for high-value employment. A major impediment to moving young people into jobs in the private sector is the education system—both at the university and high school level—which has both a low pass rate and little focus on practical skills development such as business or vocational training; both could be helpful for Gambians wanting to enter the country’s agribusiness, services, and tourism industries. As well as building up sources of resilience, global peace and development agendas must address threats to The Gambia’s progress, such as a lack of investment in new forms of energy. The country is solely reliant on fossil fuels for electricity generation. The National Water and Electricity Company (NAWEC) is also the only national supplier of electricity, with the rest coming from household or commercial diesel-run generators. Yet the NAWEC does not have sufficient generating capacity to sustain the country’s energy needs. Under Barrow, there is widespread complaint that the population experiences vast periods of time without electricity and that supply was more reliable under the Jammeh regime. Thus far, development of other energy sources—such as renewable solar, wind, and bio-waste—has been limited. However, the anger over disruptions, as well as the volatility in petroleum prices has encouraged the government to look into development local and renewable resources in order to mitigate shortages. Investment in new renewable energy projects could provide a means of households being able to meet their electricity needs, as well as enhancing economic development. Many African countries, including Ghana, Cote’ d’Ivoire, and Tanzania have implemented a variety of affordable solar power initiatives, which assist both business and individual homes. These home-based systems can often only power a few lights, a mobile phone charger, and a television, but assist when there are rolling blackouts and in easing the economic burden on small businesses. The Gambia’s sustainable development could also benefit from a renewed commitment to enhancing the agricultural sector. In recent years, yields have suffered, particularly due to the droughts in 2011, 2012, and 2014; late rainfall as a result of climate change; and poor governance. Although the previous government invested heavily in agriculture, there are still a lot of further opportunities for increasing capacity to serve the larger West African market. There are also opportunities for cashew processing, “with one of West Africa’s biggest cashew growers, Guinea Bissau, less than a day away by truck”. Investing to increase domestic markets and address the lack of hard and soft infrastructure, such as roads and reliable electricity, could further enhance agricultural activity and bring in much-needed economic growth. Given the complexity of the task, there is a clear need for some form of coordinating body or process to play a role in guiding The Gambia through a difficult period in its history. The inclusion of the country on the UN’s Peacebuilding Commission agenda would be one means of ensuring it receives sustained international attention and support. The formation of a country specific configuration would see the commission work closely with Barrow’s government to identify challenges and opportunities; develop recommendations for better peacebuilding; outline the commitments of various stakeholders to achieve sustainable peace; mobilize support in the international community for these efforts; and monitor progress in peacebuilding and meeting commitments by various stakeholders. Mirroring its response to the post-election climate, the West Africa regional community could also continue to engage with one voice and a unified strategy on The Gambia and help sustain international attention on the country. ECOWAS and the UN Office in West Africa (UNOWAS), as well as other international actors, could help to build capacity for government officials, including through facilitating study tours and lesson sharing approaches. A good example would be the initiative of a South African-based civil society organization, ACCORD, which facilitated study tours for key actors in Burundi, Liberia, the Democratic Republic of the Congo, Sudan, and South Sudan to learn about South Africa’s reconciliation process and share their experiences on elections, governance, and post-conflict peacebuilding. These initiatives promote lessons and expertise-sharing as well as enhancing bilateral relations on the continent. Within this type of relationship, UNOWAS could continue regular visits to The Gambia to support the government and hold regular meetings between the Special Representative of the UN Secretary-General Mohamed Ibn Chambas and President Barrow. As The Gambia’s new government moves to consolidate its position with the support of the regional and international community, there is a need, as sustaining peace advocates, to adopt an integrated approach to peace and development. The 2030 Agenda offers a roadmap to address challenges and realize a future with an inclusive and sustainable development for all, by outlining how each goal is connected to one another and must be pursued in an integrated and holistic fashion to ensure long-term peace and development. Within this process, there is a need for strong leadership; adequate, predictable and sustainable financing; partnerships between private and public sector as well as the international community; and an ongoing process of strategic analysis and response. Should the challenge of responding to The Gambia’s ongoing transition be managed effectively, it could provide a model for applying principles of prevention and holistic peace and development throughout the world. Lesley Connolly is a Policy Analyst in the Center for Peace Operations at the International Peace Institute.